Colour: deep ruby red with garnet glints. 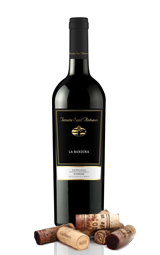 Aroma: fruity, intense with hints of cherry, red fruit, liquorice, tobacco and cedar wood. To drink in particular with pasta dishes with intricate sauces, grilled red meat, roasted and braised meats, lamb and game, ripe but not strong cheeses.